I do not know how long I did not write letter mail except for my mom who does not know what email is. I think many people like me they do not like writing, and also if we knew email why to use snail mail? Easypost is a Canadian web service, that offers you send mail via postal delivery in Canada. How does it work? You can visit its website, and compose your mail. 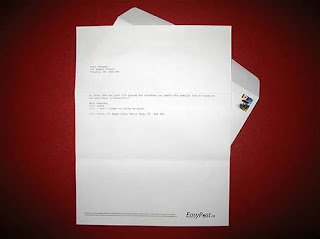 Then, it will print your mail on paper and mail it via postal delivery. Sounds good? Now, this service is limited time free, so if you live outside Canada and have someone lives in Canada, you can send mail without international postal fee.